Dogs, just like humans, can suffer from anxiety. In fact, it’s a pretty common trait in our canine friends. Sure, they’re pack animals, but dogs by nature aren’t meant to live by our human rules. Having to walk past strange dogs head-on at the park is not natural for dogs. And what about those strange mailmen your dog swears is there to murder everyone? When dogs suffer from anxiety, it can be hard on both the owner and the pup. Some vets prescribe medication, like Xanax, to calm a dog’s nerves, but the side effects can be troubling. If you’re looking for a natural way to manage your dog’s anxiety, Treatibles CBD treats may just do the trick. Along with anxiety, the phytocannabinoids in Treatibles can promote healthy joints, aid in digestion, enhance appetite, alleviate discomfort and even prevent seizures. What Makes Treatibles CBD Dog Treats So Special? Treatibles has been in business since 2013. The company regularly works with veterinarians, behaviorists, groomers and animal communicators around the world. Made with high-quality ingredients sourced in the U.S.
Phytocannabinoids are especially effective in dogs because they have a high concentration of cannabinoid receptors in their bodies and brains – even more than humans. 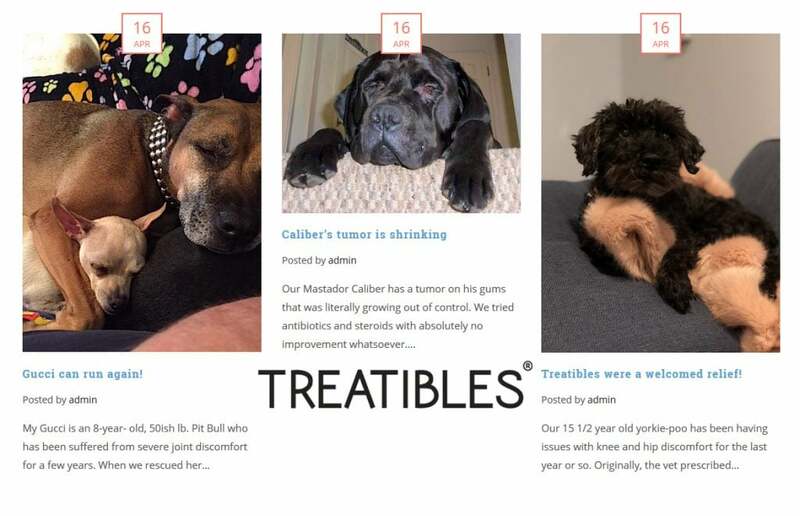 Treatibles allows you to take advantage of these receptors to help your pup live a calmer, more balanced life. Plus, dogs love the taste of Treatibles. They come in pumpkin, blueberry and turkey flavors. On top of everything else, Treatibles is also committed to charity. They often offer special flavor treats in honor of certain rescues, and a portion of those proceeds is donated to the rescue or charity. Are Treatibles 3rd Party Tested? Yes! One of the biggest concerns with supplements – for humans and dogs – is the ingredients. Supplements aren’t regulated, so you never really know what you’re putting into your body (or your dog’s body) without third-party test results. Treatibles runs lab tests at every stage, from raw materials all the way to the finished product. The tests quantify the milligrams of phytocannabinoids in each treat, gel cap and dropper bottle. The company also tests to ensure their products are free of heavy metals and contaminants. Every product page contains a link to the third-party lab results, so you can see them for yourself. Where Does their CBD Come From? The hemp used in Treatibles’ products comes from medicinal grade hemp grown in the United States. Terpenes are also included to create the entourage effect. For added peace of mind, you should know that Treatibles’ products are legal to sell and ship in all 50 states. Treatibles makes it so easy to give your dog their products. The company even provides serving suggestions to ensure that your pup gets just the right amount of CBD. The company recommends giving 1mg per 10/pounds of your dog’s weight. Treats can be given as needed. Treatibles also provides a servings chart for all products, so you know exactly how much to give according to your pup’s weight. To make things even less complicated, there are serving suggestions listed on the product page itself. Let’s get down to the good stuff and take a closer look at each product, its serving suggestion and its ingredients. Treatibles is probably best known for its CBD dog treats. Dogs love treats, so they’re easy to give. The company makes two sizes: one for dogs under 50 pounds, and one for dogs over 50 pounds. All treats are grain-free and non-GMO, so you don’t have to worry about feeding your dog ingredients that are detrimental to his health. The turkey flavor also has turkey and sweet potato. The pumpkin flavor has pumpkin, and the blueberry flavor has both pumpkin and blueberries. It is recommended that you give your dog 1 mg per 10 pounds. So, a 20-pound dog would need two chews. Treats can be given every 4-8 hours as needed. Along with the phytocannabinoid rich oil, the oil products also contain either grapeseed or MCT coconut oil. The oil gives you a little more flexibility when it comes to serving size, and it also gives you more control over how your dog receives the CBD. If your pup happens to be allergic or sensitive to any of the ingredients in the treats, the oil may be a good alternative. The gel caps are the ideal option for large animals, and they contain ingredients that improve absorbability of the oil. The 10mg gel caps are designed for dogs of 100 pounds or more (one gel cap per 100 pounds of weight). They can also be given to pigs, goats and other larger animals. The 25mg capsules are designed for animals that are 250 pounds or more – such as really big dogs, pigs, goats, horses and other animals up to 2,000 pounds. Treatibles has a product for every size dog, and the variety of product types (e.g. treats, capsules and oils) make it easy for pet owners to find a good fit for their dogs. And the company says the phytocannabinoids in their products are safe, non-toxic and can be taken for extended periods of time. 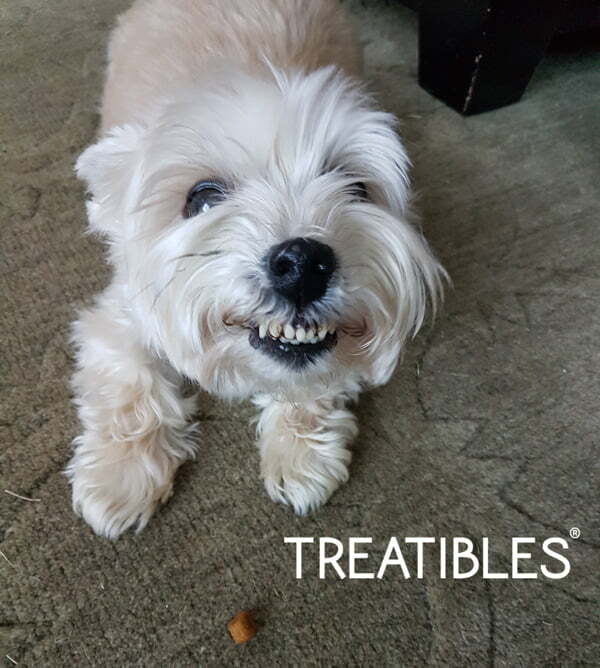 Treatibles is our favorite CBD dog treats brand. Their products contain just a few ingredients (all of which are actual food items), and they work quickly. Most pet parents notice a change in their dog’s behavior anywhere from 5 minutes to one hour after taking the treat. And because these treats are non-toxic, you can give them to your dog as needed. While the company offers serving suggestions, it’s important to remember that every dog is different. Some may need more or less CBD to see effects. Here’s the good news: it’s virtually impossible to overdose on the phytocannabinoids found in the company’s products. No matter whether you have a Chihuahua or a Great Dane, Treatibles can help. There’s a serving size and product type for every breed and preference. Even very large dogs and horses – 250 pounds or more – can use Treatibles to ease anxiety without worries of overdosing. The science behind the product is there, and we’ve seen hundreds of positive testimonials. There may be a learning curve when it comes to figuring out how much and how often to give the product, but most dogs respond very well to Treatibles’ products. You won’t find Treatibles in big box stores. You might find them at a handful of specialty pet stores and groomers, but there’s no guarantee there will be any stores that carry it nearby. The best and most reliable way to get your hands on a bag or bottle of Treatibles is to buy online. And we have an exclusive coupon code just for our readers. 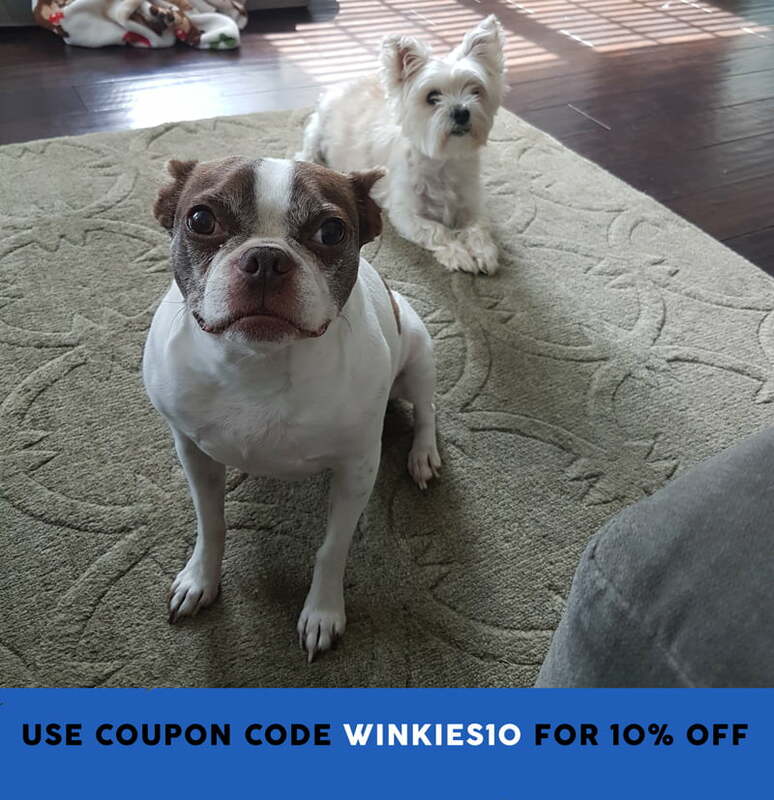 Use Our Treatibles Coupon Code: WINKIES10 for 10% off! If your dog is suffering from anxiety – whether it’s thunderstorms, fireworks, separation anxiety – Treatibles can help restore a natural calm, balanced state. No dog wants to live in fear or anxiety. The phytocannabinoids in Treatibles can provide natural relief, so you and Fido can get on with the business of enjoying life.